Kate's Natural Bee Boxes... Save the Pollinators! Kate's beautiful bee boxes are made by hand in Maine. They look great in your yard and provide a nesting spot for local pollinators. Our bee boxes provide cover and places to raise young for bees. The type of bee most commonly found in our bee boxes is the Blue Orchard Mason Bee. Mason bees do not live in a nest or hive like other bees. They live in wooden blocks or trees. Mason bees don't drill holes and destroy wood like some other bees. Instead, they rely on holes that are already available. The male Mason Bee can not sting and the female rarely stings. Colony collapse disorder (CCD) has impacted the viability of honey bees throughout the US. Some gardeners have reported that pollination is suffering. You don't have to become a bee keeper to ensure good pollination of your plants. You can help native pollinators in your area by providing bee boxes for solitary bees. Solitary bees don't live in a hive (like honey bees). 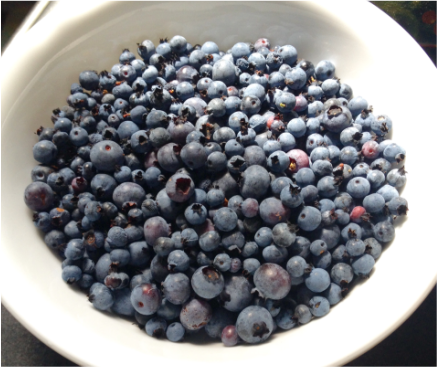 These native bees (such as Mason and Osmia bees) pollinate many important plant species (like Maine blueberries!) and are not affected by CCD. Installing bee boxes in your yard will provide a great boost to pollination of your plants and help ensure that your garden is successful. Hosting native bees is important to ensure complete pollination of your flowering plants! About Kate's Natural Bee Boxes? Measuring approximately 8"x8"x2", they are manufactured from Eastern white pine or hemlock (depending on availability). The lumber used is certified by the Forest Stewardship Council (FSC). We are proud to use Maine products and sustainable lumber. The cause of CCD is not known, but modern agriculture (with large fields of monoculture and overuse of pesticides) can't be helping the situation. What is monoculture and why is it a problem for bees? Monoculture is the agricultural practice of growing many acres of the same plant (think amber waves of grain and corn belt). However, the real problem is not grasses, but plants that require pollination by an insect. California almonds are a great example. Honey bees are trucked or flown from all over the US (and from outside the US) to pollinate the hundreds of acres of almond trees that grow there. This is not a natural condition. Nature didn't put only one species of flowering plant in an area-- how could bees survive year round if the area supported primarily only one species of plant that flowers only a few weeks a year? Bee boxes make great gifts for gardener friends and family. Our bee boxes are $17.98, which includes shipping (within the continental US) and the mounting hardware. We ship bee boxes and complete instructions to you by priority mail (2-3 days). We have a few on hand, but large orders will require a few days to produce. When you order, you will receive a confirmation e-mail with estimated shipment date. Please note: No bee boxes are available right now. Please check back in May 2018. You can also pick up bee boxes! 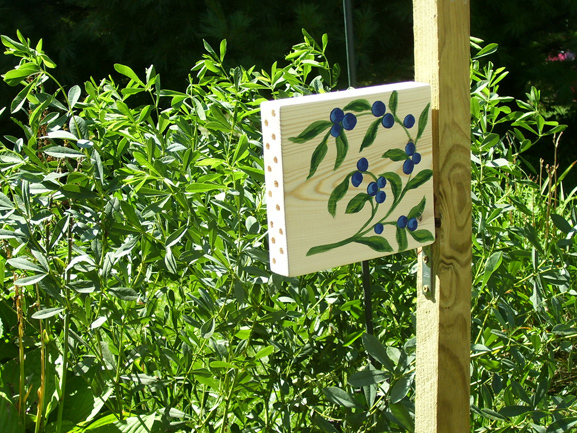 If you are in Southern Maine, you can pick up bee boxes ($12.00 [or $13 with mounting hardware] & save $5.00 on shipping). Send an e-mail to make arrangements. How do I care for bee boxes? Place them where they will find mud to make their nest and safe from being knocked down. Other than that, make sure the wood is not cracked. Bee boxes may need to be replaced after a few years if the wood cracks. In Maine, our bee boxes typically last 3-4 years. Apiasts (bee keepers) are needed, but the experts say that they need bee KEEPERS, not bee "havers". The difference being people who closely monitor their hives and spend time learning about maintenance and upkeep vs. just putting a few bee hives out and checking on them occasionally or just harvesting honey. With solitary bees, you don't need all the bee keeper equipment and classes. All you do is put out a few bee boxes and maintain them. Because these bees are solitary, it is a LOT easier. In addition to putting out native bee boxes and , you can support local pollinators by: 1. provide habitiat for other solitary bees (like bumble bees) 2. provide plants that flower year round to provide food for bees 3. be careful with (or better yet, don't use) pesticides. Many harm beneficial insects as well as pests 4. buy local agricultural products that will send a message to large producers. By voting with your dollar, you tell producers that you support native species.